With a show like Bonjour♪Koiaji Pâtisserie (which will be shortened to "Bonjour" from here on out), one is supposed to relate with, to some extent, the main heroine and the cast surrounding her. We're supposed to understand the situations, the happenings, or the predicaments that they're found in. Or at the minimum, at least understand what message the anime is attempting to portray. But behind all of the cakes, hunks, and pretty art lies something sinister: practically nothing. Bonjour stars Sayuri Haruno, a young high school girl looking to make a name for herself in the hobby of making sweets. Therefore, she enrolls in Fleurir Confectionary Academy, where she meets her friends and professors for the coming year. This is quite the difficult anime to talk about. Bonjour is technically classified as a harem -- or with further anime jargon, a reverse harem. But that's where the show's problems begin. When it comes to harems of either the male or female variety, it's paramount that the harem-ers show some sort of interest towards the person of their affection. Yet, Bonjour doesn't do this; rather, it shows only one character do this, Ryou...but then subsequently forces him into the friend-zone with a literal handshake and nothing more. It's even stranger for the rest of the cast, because what is given isn't emotional connections or loving feelings but a teacher-student relationship. Which is understandable, given that those are their positions within the school. But then what is the overall point? With nobody to cheer for, with nobody to cheer against, then it fails as a harem and succeeds as being this weird amalgamation of "friends." Even if one ignores the harem aspect, the only remaining part to fall back on is its slice-of-life foundation. But again, it cannot hold itself up. Many of the events can most certainly be classified as slice-of-life: snowball fights, getting a cold, and going hiking are some of the very simple scenarios that take place. There just isn't any substance to any of what goes on. With the harem already having failed, it becomes evident why this is the case, since most encounters generally never contain feelings that go beyond a good friendship. Furthermore, much of what goes on never serves any true purpose. It just comes off as the cast going through their day-to-day lives without meaning much of anything to themselves or to the audience. And catapulting off this, the show is supposed to be about all-things sweets, candies, and desserts. Sticking true to its established roots, though, it fails to use even its backdrop in a meaningful way. The creation of the various foods is sometimes prioritized in a focused manner for aesthetic appeal (in terms of the food and the guys), but it's never used to further the characters' development or the story. An argument can be had for the near ending "battle" that takes place, but that, too, is forgotten quite quickly, only furthering the already ineptitude of the series' direction. Bonjour's strongest point is found here, with its overall art and animation. The art for the show is usually quite pretty, even given their usual, central location. This is perhaps due to the show's use of lighting and varied day-and-nighttime events. The school itself is appropriate, with its different classrooms, kitchens, and grounds. It also regularly moves outside the school, to the city, parks, or other shops, to spice up the environments. Perhaps as an attempt to keep the viewer at least marginally interested as to what is going on. The character designs are the highlight, with their overall level of detail and apparent quality to be quite high. Each has this certain sheen to them, which allows them to almost sparkle or standout in a positive way. Sayuri's design is especially nice, with her intricate hair and many outfits. The guys, from Ryou to Mitsuki, are also detailed in such a way. Their most obvious feature is a particular color, but that doesn't take away from how well each was designed. Finally, actual animation is around average. There aren't too many opportunities for the show to have the characters move about in complex or nuanced ways, usually falling on easy mouth movements or other nonchalant activities. The anime does step it up slightly during the aforementioned dessert-crafting scenes, but those are too far and few between to be considerably noteworthy. Sadly, Bonjour's troubles continue here with its characters. ...And again, it's very difficult to talk about them at length. The problem is that the majority serve nothing besides the food they make. Gilbert is somewhat clumsy yet kind at heart; Yoshinosuke is stern yet caring; Mitsuki is completely understanding; and Ryou is unnerving on the outside yet sweet on the inside. Each of their characterizations is fine, but after their initial showings, they don't help Sayuri develop in any way. They sort of provide different perspectives on life and the way to handle going about weird issues that normally have to be dealt with, but such themes are never explicit nor are they compelling for the viewer taking part in the experience. Unfortunately, Sayuri fairs about the same as well. This is most likely due to her harem being extremely weak. But like them, outside of her affable personality and super-nice self, she isn't known to have received much treatment in terms of personal growth, despite her coming to the academy to purportedly become a high-class pastry chef. She has these minimal, grounded experiences that allow her to see that what one should cherish are the people and experiences around you. This is reverberated a bit throughout the show at certain points, and during that already-talked-about final battle. Still, even given that she comes to realize that the best things in life are "close to home," it doesn't excuse the fact that, execution-wise, she doesn't seem to improve. The end of the show demonstrates this; she still has no idea that life's events aren't so come-and-go. She begins wanting to have a fun time at school, and ends wanting nearly the same thing. Imagine the characters as particular treats. Sayuri is the cupcake, topped with decadent frosting and lively sprinkles. Ryou is a chocolate piece hiding a creamy, caramel center. Mitsuki is "rainbow flavored" ice cream. Yoshinosuke is an edge-brownie, with its less-chew-able back. And Gilbert is a crumbly cookie cooked to perfection. Alone, they sound pretty good and possibly for some, when combined into one, it sounds like sugar-heaven. But when one does mesh them all together, what you are left with isn't a delicate, delectable dessert but an inedible, unsatisfactory mess that leaves a horrible taste in the mouth. The OP is filled with drums, pianos, and rather grating vocals. The shaker in the background, the clapping, and the whimsical chimes try to elevate the piece, but it falls flat instead. The first ED is somewhat fast, with the singers working in unison. The guitar and drums make up the majority of the beat in the beginning, but eventually ends with a flute-y tone that finishes the piece on a literal and figurative high note. The track is okay, but not particularly interesting. The second ED has more dual-singing, with a much catchier beat generated by the very simple drum and guitar playing. The chimes are present here again, but the track ends on a more melancholic note than the others. Aside from being able to bob one's head to it easily, the track is nothing to phone home about. The anime's soundtrack is somewhat strange, in that many of the pieces feel oddly too short for their own good. There are more fitting pieces such as the Spanish-sounding, maraca-and-harmonica track and unfitting, joke tunes for the more comedic moments. Again, unlike some of the OPs and EDs it is sandwiched between, though, the OST is entirely forgettable. And when regarding the voice-acting work, those involved were around average across the board. No special shout-outs are to be had for this one. The show tries, as much as it can, to be funny. Most of the time, it involves the side characters, such as Tsubaki -- the girl who "hates" Sayuri -- and Nadeshiko -- the president of the school -- but their repetitive nature and gags quickly degraded whatever comedic value this one may have been trying to grab. When the "romance" scenarios were given the chance to play out, going along with what has already been said, there just wasn't enough there. Ryou being on a dating game with Sayuri, the two enjoying a snow-filled park, or her and Mitsuki gazing at the starry, nighttime sky; each sounds very romantic. But in practice within the anime, it's quite lame to see the same outcome is always had: not being able to tell one way or the other how each of the characters feels about each other. Bonjour♪Koiaji Pâtisserie is supposed to be an anime about pastries, harems, and enjoying life. But instead what is found is a lame story, a troupe of awful characters, and quite the boring experience. It's only saving grace is the nice art and animation, but that's not enough to keep this dessert from burning. For starters, I just watched this anime because it was a reverse harem. As there is very little in that genre, I thought I should give it a try, and I'm going to be truthful and say that this anime was quite a waste of my time. 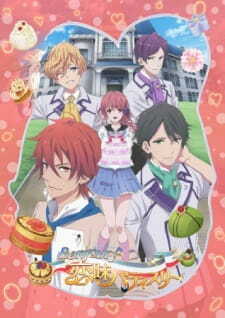 Story: I assumed that the story would be something interesting, but it turned out to be a rip-off of Yumeiro Patissiere. This was incredibly uninteresting and evoked no emotion from me. Art: I give a tiny bit of kudos to the "bishounen" styled art as they had good sense of fashion and the colors complimented each other, but the fact that the little "romance" scenes were so flowery and cutesy made me want to gag a bit. I also noticed some weird things going on with their eyes or hair here and there, like the were glitching or seemed out of place. Sound: The sounds was okay, it was very childish and did not seem too romantic. It's soundtrack did not improve the animation in any way. On the other hand, the voice actors and actresses were.. alright. They did not stand out to me too much, besides the fact that their voices would get all high and squeaky, which annoys me. A LOT. Character: I expected more development of the characters, but did not see any, besides the fact that their fashion sense was really good at the last episode. Enjoyment: I did not really enjoy it. It was like a boring train ride. Overall: Well, my thoughts right now is "at least I got this anime done and over with". Nothing in this anime really struck me emotionally, but only visually. I think this anime is only good for it's eye-candy, otherwise if you are looking for something that is cute all the way through, I recommend this. Though beware, do not expect any memorable things. This is something that you could probably watch if you have some free time to throw away. This show is the cutest thing ever! The artwork drew me in when I came across this title. Its funny I was not expecting the episodes to be around five minutes. It didn't look like one of those short episode animes. Which sort of drew away from the story being its best. The first episode was 3 minutes long and I stared at the screen and said "That's it?" and I laughed. I still really like this show other than the pacing of the story. They could have done so much more with it. The music really set the atmosphere for the show and also all the sparkles. The opening song gets stuck in my head, it is so catchy that I accidently started singing it in choir instead of paying attention haha,it was very embarrassing because my friend looked at me confused. The artwork is like something you would see in a dating sim which is funny because I heard there is a otome dating sim that the anime was based off of. I think this show could have had 24 minutes per episode but its okay, that is just how they made it. The main character is very likable and cute just like a dessert. funny, it is a show about patisseries and there are so many cute sweets in the show. Also I like the main characters realationship with her friend, even though the episodes are short and sometimes skip ahead in the story, you can tell they are truly best friends. Also all of the guys in the show are so cute! I love them all! I would give this show a rating of 8/10. I had been watching a lot of gory and heavy anime as of late, so I thought I would take a change of pace and go for a nice harem school life sort - you know, just to sit and enjoy. ‘Bonjour’ was just what I needed to clear my mind before I delved into darker and murkier waters again. And with the series having just finished up this last Friday it made it easy to binge watch it. Now if you’ve played Otome games before or have watched other anime based off of an otome game then you wouldn't be surprised by the plot of the show. I’m not going to dive very much into it, but for those of you who haven’t watched/played one before here’s the gist of the plot: Cute girl goes to a specialty school, she meets all the boys who will eventually come to like her, there is a rule in the school that disbars relationships, hijinks and fun times ensue with each boy getting their own special one on one time with the girl. Needless to say, the plot was standard at best. It basically felt like you were watching someone playing the game and experiencing standard dialogue and comedic scenes (and making pastries!). This isn’t a bad thing, but it brought nothing new to the table. The upside is though that the episodes are only 5 minutes long, so you could easily watch the entire series in an hour and a half, maybe even an hour if you skip opening and ending themes. Just like the story, the music sounded like it came straight from the game - so it was nothing spectacular. The opening and ending themes were short and to the point, which I especially liked. It comprised of the main male cast singing, which was pleasant to listen to. All the voice actors did a good job in their roles, playing their respective characters well. My favorite out of the cast though was Ran Mochizuki , who I thought was hilarious, and always made me laugh every time that she spoke. The show was bright and colorful, and the deserts absolutely looked DELICIOUS. The scenery was beautiful too with the coloring setting the ambiance of the show very. However, I thought the characters looked somewhat generic. Granted, there are only so many different ways you can draw the heroine and her band of good looking love interests. And there’s nothing wrong with the heroine looking generic, because you are supposed to be able to insert yourself and become the main character. What made me sad was that I didn't particularly find any of the guys that appealing looking. Yes, they were pretty (I guess), yes they had great and eye catching hair color, but they didn't look DIFFERENT compared to any of the men that I have seen in similar series. If I had to pick any one of them on looks alone it would probably be Ryou. Once again we see standard otome game character dynamics. Sayuri is a classic Mary sue who tries her best at everything and has a real talent for pastry making, but is of course insecure about her abilities. She is wildly popular, except by for the one mean girl and her backup possy that dislike her for no good reason. Ran is the best friend that tags along and encourages Sayuri, while staying out of the spotlight. Tsubaki is the mean girl who self declares herself Sayuri’s rival as a chef; her purpose is to provide comedy. Mitsuki is lovable and good natured, Gilbert is foreign and of course ignorant of Japanese ways, Yoshinozuke is quiet and can be serious but has a gentle side as well after you get to know him, and Ryou is the tough guy and can be scary but is the one who ends up showing the strongest feelings for Sayuri. Like I said - pretty standard. Their backstories are lightly touched on and have just a tad of drama/sadness to give them a darker side without ruining the general light and fluffy feel of the show. Overall the show was just standard. There was nothing about it that broke away from the basic reverse harem/otome game genre. Now I’m not saying this is a bad thing because it’s a staple for a reason. It’s familiar and comfortable and easy to get into right away. Like I said, this was a nice show to start spring break with and to get away from the dark stuff and from the stress of exams. But if you are trying to find something that’s new or exciting or has a little flair, then this show might not be for you.